This is where I create the forms to embed in the blog post. Once I know what I want to ask, I create the form and set up the response destination. I also restrict viewing to my education domain, and automatically collect user IDs. When the form is ready, I click on File - Embed... to get the Embed code for the form. This will allow me to put the form directly into the blog post, avoiding the need to click on another link. Keeping all the information on one page and creating a seamless problem & answer format is one of the things I really like about this method. 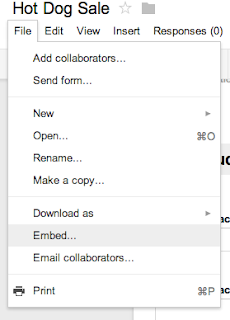 Copy the embed code to your clipboard and then go back to Blogger. In the Blogger post editing window, switch from "Compose" view to "HTML" view. Then paste the embed code at the bottom of the text. An optional part of the process (but one I really like) is the ability to schedule posts. This lets me set up a week's worth of problems at one time, schedule each to post on the appropriate day, and let the system do its thing. On the right-hand side of the Blogger compose window, click on the triangle next to Post settings, and click schedule. 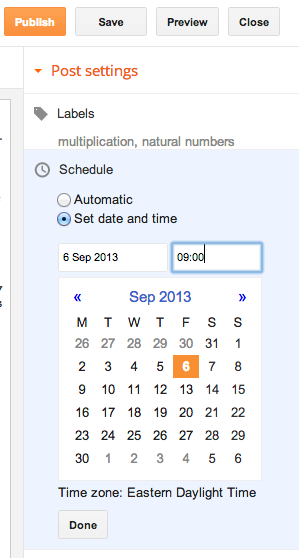 Pick a date and time, and then click done. The final step of the process is to click on the orange Publish button. This will confirm your settings and Blogger will automatically publish the post at the set date and time. On your weebly site, add a "Feed Reader" element from the left-hand control pane. You will configure this to read your blog's RSS feed. Adjust the settings as you like (I have it set to show the 3 latest items). That's it; publish your weebly site, and you're done. Now every time a scheduled post is published to your blog, it will automatically appear in your weebly site. You do not need to re-publish your weebly every day. 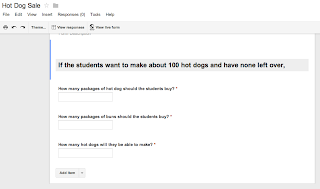 I will be using the Google Apps Flubaroo script to grade student responses, and I will collate the data into one Google Sheet to record their performance for the year. I use Google Drive to create any necessary graphics to embed into my Blogger post or the associated Form. By using the URL of the Google Drawing, I can update the image and the changes will automatically be pushed out into the rest of the process. I change the "Accepting Responses" setting on the forms as they expire. Forms will accept responses up to an including the day of the POTD. 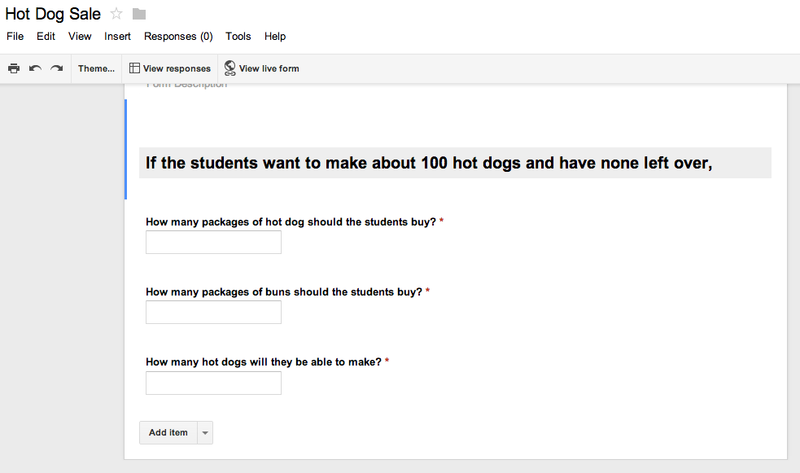 Since the form is not public until the scheduled post is published, students have a limited amount of time to respond. I have not yet found a way to automate this process. I may try to write a Google App Script to change this setting (or if there are any programmers out there who would like to volunteer) when I use Flubaroo to grade the assignment. I use Labels to categorize each problem into its required skills. This will allow me to create a database of POTDs for use in the future. It's a lot of front-end work right now, but it will become a great resource as I continue to build it up. I will likely be creating a similar blog for a daily writing exercise for my English class (but I may simply ask students to respond through the comment feature, rather than embedding a Form to collect responses). If you would like to see the blog, it's available at http://mat10604.blogspot.com (although you won't be able to see or submit a response through the Form). I hope this encourages you to try out embedding a blog into your own site.